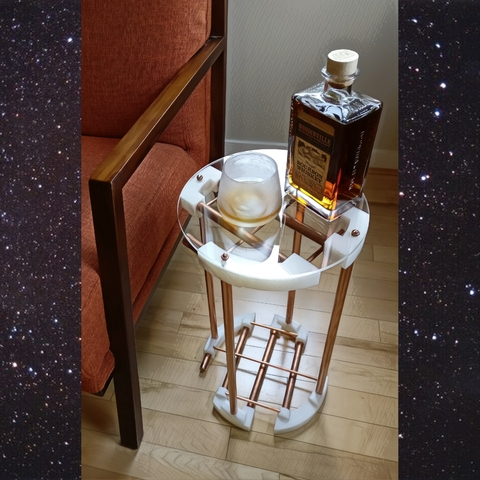 "Orion's Belt", an industrial modern cocktail table assembled from 3d prints and copper pipes. 1) Print four copies each of both parts. I chose white PLA for a clean look, but a wood-based filament could also be attractive. My printer couldn't fit a whole piece at once, so I have also provided files to print each piece in half--in that case print four copies each of all the halves. If you print the halves, use an epoxy to glue the respective halves together. 2) Use a pipe cutter to create the quantity and lengths of pipe as listed above. 3) Assemble two layers of "Orion's Belt". 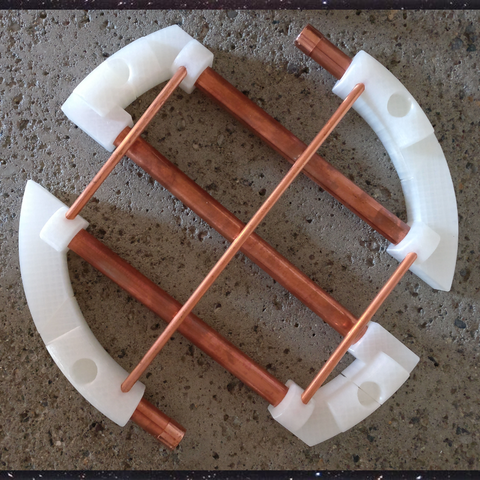 A single layer is assembled using two each of the 3d printed parts. The 10" pipe goes down the middle, connecting two of the smaller parts. The other side of each smaller part is connected to a larger part using an 8" pipe. 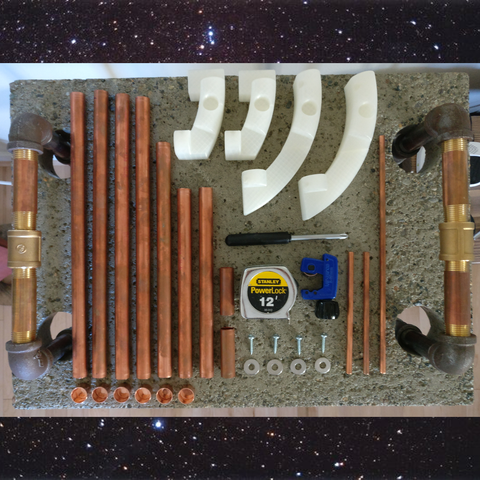 The 2" pipes protrude from the remaining side of the larger parts, and are each capped with a copper pipe cap. The smaller diameter copper pipes are used as cross braces: a 10.25" pipe runs across the middle, and two of the 5.25" pipes parallel this one on either side. Consult the pictures for the proper layout. 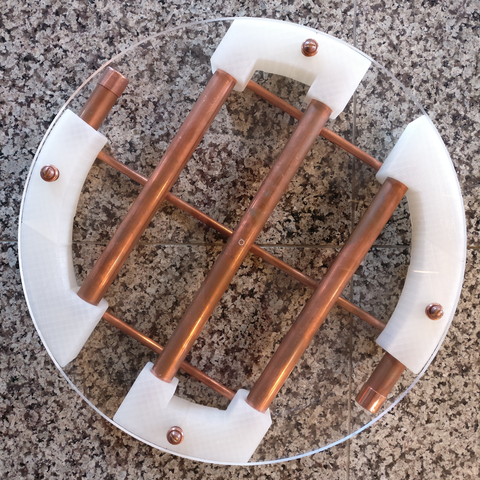 4) Using a skill saw, band saw, or router + jig, create a circle of the desired size from the sheet of plexiglass. 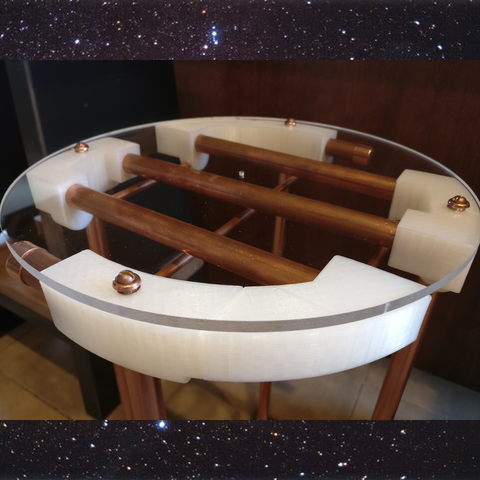 I chose to leave no overhang on my Orion's Belt, which equated to a circle of diameter 11.75". I think an inch or two of overhang would also look nice, in which case you might need to start with a larger sheet of plexi (in fact I ordered a 12" x 12" plexi, but it arrived regretfully shorter in both dimensions). 5) Place your plexi on the flat side of one of the Orion's, and mark the locations designated for the #8 screws. Then drill through holes in the plexi. Be very careful on this step as drill bits like to travel and tear up your pristine plexi. 6) Affix the plexi to the flat side of one of the Orion's using the #8 screws and washers if desired. 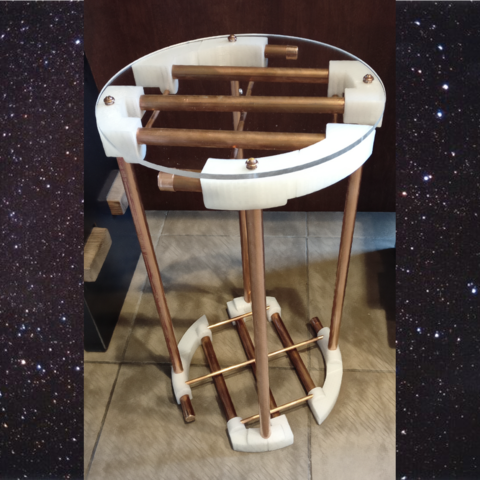 I used synthetic bronze screws and finishing washers for the matching effect. 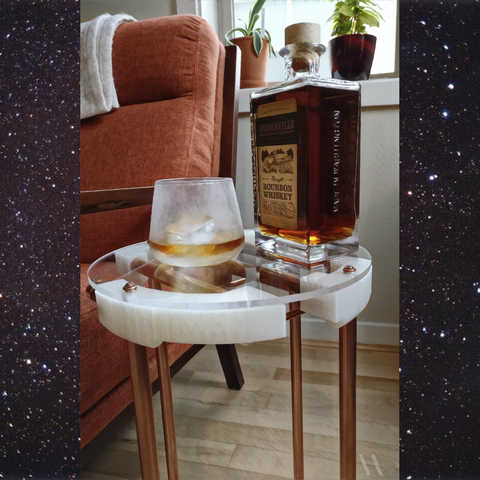 8) Pour yourself a nice bourbon on the rocks, sit back, and dream about the stars while admiring your newest creation (after "liking" my entry of course). I printed on an old, refurbished PrintrBot Play; so you can probably be more aggressive in your settings! No support needed when printing the whole parts, but I used supports on the halves to support the interfacing geometry.